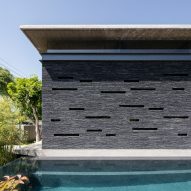 An outdoor swimming pool runs along the full length of this black residence by Israeli architecture firm Pitsou Kedem, which features slate walls both inside and out. 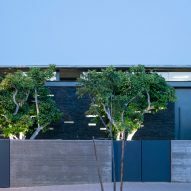 In a residential area north of Tel Aviv, the 3,229-square-foot (300-square-metre) Pavilion House spans two storeys topped with a flat concrete roof. 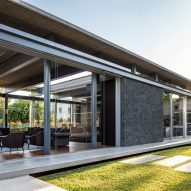 The building is supported by a series of pillars around its perimeter, and enclosed with various sliding glass doors and other concrete portions covered in slate. 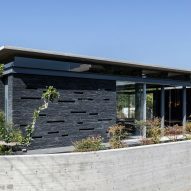 These stone facades are punctured with a series of narrow windows that filter light inside. 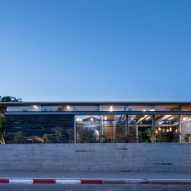 Pitsou Kedem Architects hid half of the house underground. 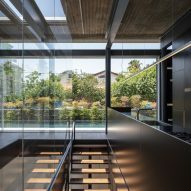 Glass-lined voids around the building's perimeter, as well as an atrium at its centre, allow light into the basement spaces. 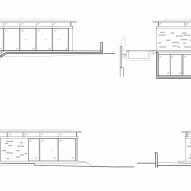 Above grade, a mid-height concrete wall encloses the property to provide privacy. 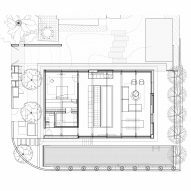 Outdoor spaces include a courtyard area, and a swimming pool with water level with home's main floor. 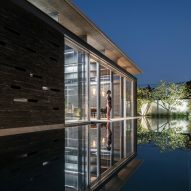 At one end, swimmers can be seen through a glass panel – a feature enable by a slight change in elevation between the access path and the entrance to the house, which are connected by a short flight of steps. 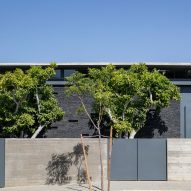 Upon entering the home is a black corridor that leads to an open-plan dining and living room. 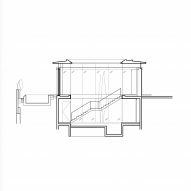 A central stairwell, located beside the atrium, is enclosed in glass and divides the layout. On the other side, a galley kitchen features black built-in cabinetry that blends in with walls. 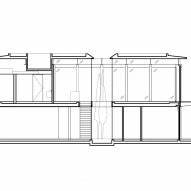 A bedroom, complete with a walk-in closet and bathroom, is also situated off the kitchen on the upper floor. 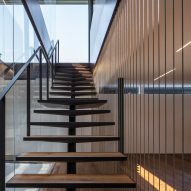 Floating steps lead down to a basement, which serves as a flexible space. Glass, slate and concrete are visible across the ceiling and various walls throughout the interior. 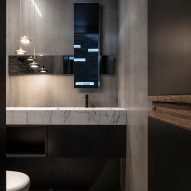 Black and grey feature prominently, while oak floors soften the stark contemporary aesthetic. Lighting was completed by local designer Orly Avron Alkabes. 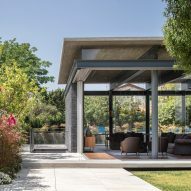 Pitsou Kedem has built many homes in Israel with similar rectangular shells and expanses of glass. 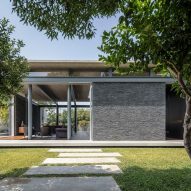 Other examples are a concrete house designed around white perforated aluminium facades, a residence with a slatted pergola-style roof and a two-storey white house with geometric metal screens.